We’re looking forward to meeting you! PIHRA's Burbank location serves the Burbank and Glendale area, as well as surrounding areas including Hollywood, Studio City, Sherman Oaks and North Hollywood. Our district meetings are typically held the 4th Tuesday of the month; however the actual dates may change. Take a look at our schedule below to see our upcoming events. Our meetings are great opportunities for HR professionals like yourself, Benefits Providers, HR students, or HR professionals in Transition to network with other HR professionals in your community and to learn from our expert speakers. By attending a meeting, you will also earn hours of General, Strategic, or California HRCI/SHRM credit. Certificates are provided on site. *Early arrival is suggested to reserve your seat. 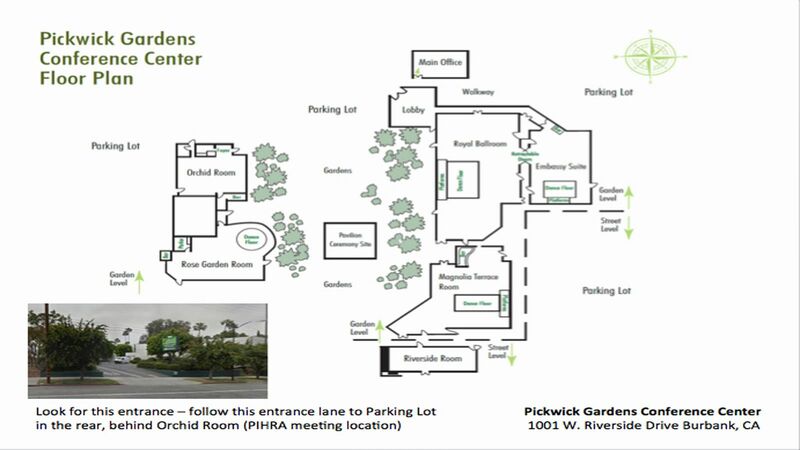 Parking at Pickwick: We are located inside the Orchid room. Turn right into the second parking lot, pass the ice skating rink and drive to the back and park in front of the garden entrance. All late registrations/walk-ins will pay the non-reservation price. We accept cash, credit cards, and/or checks (made out to PIHRA) at the door. Ask us about our VIP All Access Pass. Includes discounted registration & expedited entry! Are you a HR Professional in Transition? We realize that being in transition can be a difficult time. It is not easy to know what steps to take to secure a position for which you are qualified. Thus, we have created PIHRA Burbank/Glendale’s HR Professionals In-Transition Networking Program. To help Burbank/Glendale area Human Resources Professionals find employment and to act as a professional resource to each other. Please join us if you are a HR professional in transition, or employed but seeking a different opportunity. We will meet once a month to network, discuss and share job leads, ideas for a structured job search, resume reviews, practice 60 second elevator speech, interviewing skills, etc. We also invite expert guest speakers to share their knowledge and ideas to help the group with continuous learning of various HR topics and useful tips about the job search. There is no cost to join this professional networking group. The only ‘rule’ of participation is to be discrete about other members’ job search. For more information about our program please email us at pihraburbankmembership@gmail.com or visit us at: https://www.facebook.com/groups/PIHRABurbankInTransitionGroup/. Occasionally, throughout the year, we will offer additional networking opportunities at evening mixers and community outreach/volunteer events. See our calendar below for the most up to date information on our events.